The world is in football fever, FIFA world cup 2018 is roaring in Russia now. Big and small, girls and boys are cheering their favourite teams. Standing in this trend I was thinking about our children that how much time they spend outside playing real games. And how much time have we spend in our childhood in sun and rain, mud and water! These days screens of different kinds are overruling the real play time. Outdoor play will give many physical and social benefits to our children to hold lifelong! let’s look a little deeper to the most popular outdoor game football/association football/soccer also. How does outdoor play help a child’s development? Kids are (were) typically attracted to play outdoor and there are numerous benefits to encourage it. Parents of this day will have to take an effort to take the kid out. Once we make it a habit in their earlier age and hold the grip of that habit, they will take it forward even in their adulthood. A habit of an everyday physical activity will be the best gift we can furnish them for forever. Outdoor activity allows them to explore their surroundings, improve muscle strength and coordination, and achieve self-esteem. Playing actively outdoors also enhances flexibility, motor skills, etc. Outdoor sports is one way to include kids in interesting physical activities. Playing sports help children learn skills. Learning such skills don’t occur over a day. And kids may not show interest in the game you want them to play. So, it is important to notice their talent. I can tell you that at some time every child will show a talent. Once you catch what they are into, it needs discipline and hard work to maintain that interest. Association in sports lets kids make new friends, teammates, who can easily relate to each other because they have at least one common interest. Researches and experienced parents validate that playing sports can help teens, who during the struggling times of hormonal changes and social issues can benefit from the balance of having constant teammates, a reliable coach and a focus on something interesting outside of themselves. Football is not just a game wonderful to watch but it is fun to take part as well as have lots of social, physical and mental benefits in children. The game need not be competitive it can also be friendly and mere taking part with all other teammates offers advantages. Below are few such benefits of this greatest game. 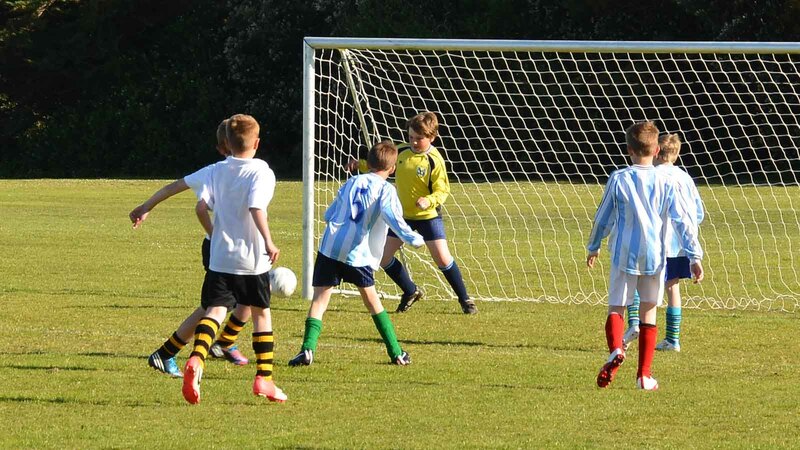 Taking part in a competitive match or simply having a kick around with some friends encourages children to get outside and retain themselves active. Enjoying an activity indicates they will want to do it more frequently, so leave them to have fun. Being parents what we have to do is the monitoring, encourage and provide support whenever needed. When children are spending more time inside walls be it in school or home they will lag behind in communication. When they grow up exposure make them more matured. Communication encourages to build better relationships. Have you noticed the words players use while playing? The words feature the team’s coordination and teamwork. Support, drop, pass, mark up, shoot are words usually heard on the pitch but so much more communication really happens within the single words. Children can discuss their tricks or chat about other teams and the schools they’re from. Spending time together on a consistent basis will help the development of deeper communication skills and more connected conversations. To play football you require a good team around you. Playing regularly will help children grow their skills and can work with their team strongly. They’ll master to play together and from their own practices they can work out the way they can be most productive as a group unit. Being part of a team will always give children a feeling of belonging and inspire them to think of others. Using time regularly with teammates will let for more relationships and more time being given getting to know each other. Bonds will form and football might have begun out as the common factor but it will soon convert just one of the things that children have in common to discuss. Children acquire fundamental movement abilities when they have begun training young. Skills like running, kicking and bouncing are the building blocks that allow children to establish a complete set of skills. Playing football gives children with an occasion to use these movements and as they play more often, their skill set will considerably increase. Football is said to have side effects also, like injuries and associated diseases. but that shouldn’t be a reason to stop them from their favourite game. Injuries can happen even if we keep them fenced inside a house. It is good for kids to be included and committed to sports, but stay yourself back from being too pushy. A child should be interested in the sport because it seems fun. If you continually bother the kid, she/he probably won’t get positive benefits from playing and could get bored out and also could stop playing. So, make sure you are encouraging based on the kid’s talent. And wait to see who is gonna win FIFA world cup ;). Cutest Baby Contest – Disgusted Yet? How to Raise Kids as a Single Mother? Previous story Arts and Science of Happiness – How to live a happy life?